Here’s a little calculator courtesy of Political Calculations that you can use to get the predicted gasoline price plotted in blue in the graph above. Just enter the current price of Brent to see the implied long-run gasoline price. And here's a self-updating reference to the current Brent price, which you could use if you come back to this page to update the above calculation. Brent moved up last week to about $115/barrel, consistent with an average U.S. retail price for gasoline of $3.71/gallon, just a little above its current value. So based on what has happened so far to the price of crude oil, I would not expect more than a minor further increase in the retail price of gasoline. Using the above 25-cent rule, even another $10 increase in the price of crude (bringing Brent to $125/barrel) would still only imply a gasoline price of $3.96/gallon, close to the price we were paying two years ago. But the bad news is that if the conflict spills over into the major oil fields in the southern part of Iraq, oil would be headed much higher than $125/barrel. This entry was posted on June 21, 2014 by James_Hamilton. Very timely JDH. US$130/bbl puts the US price at just over $4/gallon. Even at that price, the US economy will likely avoid a recession. For fun, add average Canadian gasoline prices to the last chart. Deviations are explained by fluctuations in the C$/US$ exchange rate which are in turn explained in part by fluctuations in foreign direct investment in Canadian resource sectors, particularly the oilsands. The average spread is explained by higher excise taxes in Canada. Canada’s flexibility to further increase excise taxes on dirty fuel is hampered by US taxes which are the lowest among the rich OECD countries. The fear concerns the potential for cross-border shopping and smuggling of US gasoline and diesel to increase. The question of US excise taxes is rather interesting. I realize that most Canadians and Americans simply do not care about small particulate emissions and the health impacts. But many apparently care about CO2 emissions. If you really want to hurt oilsands development, all you have to do is double, better yet triple US excise taxes on gasoline and diesel. That will very quickly send global oil prices lower and lead to many oilsands projects being canceled or put semi-permanently on hold. A number of oilsands projects have already been canceled but that is primarily due to galloping costs, fueled by the overall pace of development. Jeffrey, see below. Outside the shale boom/bubble and energy-related transportation sector, the US economy is at or near stall speed, if not already tipping into recession as of Q3-Q4 2013 to date, weather effects notwithstanding. Supporting this thesis, the acceleration of CPI from the rising price of oil and food at ~2.6% annualized YTD reduces the aggregate real rate of growth of wages and employment as a share of real final sales to ~0%, implying that real consumer spending hereafter will be ~0%, i.e., recessionary. The US economy outside the shale bubble is in recession, only The Chair, Wall St., and the NBER won’t tell us until about 6+ months after the fact. The Chair, reading from the banksters’ script written for her, is “forward guiding” 2% price inflation, apparently not realizing that a 2% or faster rate of increase of prices against the aggregate contribution of wages to final sales at less than 1% since 2000 and ~0% since 2007-08 is an effective 0% or negative annualized rate of real final sales per capita. The primary takeaway is that the US economy cannot grow post-2007 real final sales per capita with the price of oil above $40-$50. But the frackers, deep oilers, and tar sanders cannot profitably extract “oil” without the price of oil at or above $85-$100, which implies that the US cannot afford to extract costlier, low-quality crude oil substitutes AND grow real final sales per capita hereafter indefinitely, i.e., post-Oil Age epoch and the end of growth***. If we can’t grow real final sales per capita at $107-$115 oil, there is no way we can simultaneously afford to build out “renewables” at necessary scale AND maintain the existing fossil fuel infrastucture in order to permit our deluding ourselves that we can have a $100,000 Tesla in every suburban garage or mine asteroids and colonize the Moon and Mars. Doesn’t that assume the premise? What if we aren’t seeing the end of growth (which we aren’t – why exclude oil production)? And what’s your evidence of a causal link between GDP and oil? Oil alternatives are cheap! Have you priced out a Nissan Leaf, Chevy Volt or Prius C lately? Take a look at Edmunds’ 5 year cost table: these are the cheapest cars on the road! As far as Teslas go, compare a Tesla to similarly priced luxury cars: it’s much cheaper to own, overall. I hear Tesla owners talking about saving $4k per year in fuel costs – Porsches get very low MPG! Even if oil is scarce, it’s easy to manufacture electric cars: there’s very little liquid fuel used to manufacture vehicles, not that all that much in other kinds of energy (mostly electricity, which is abundant), and electric vehicles don’t take more energy to manufacture. Does anybody really think ISIS is going to get very far in the overwhelmingly Shiite areas that the main southern oil fields are in? Seems to me the main worry is that ISIS could disrupt the Kirkuk-Ceyhan pipeline. It’s not a lot of current production, maybe 400k bpd, but it’s a big share of forecast increases in Iraqi output. Pipeline design capacity is 1.65m bpd. I suppose ISIS dreams of restoring and expanding the old Kirkuk-Baniyas pipeline to the Syrian coast. NBC News just showed a graphic illustrating that ISIS controls the area immediately north, west and south of Baghdad. Well, Baghdad is a very different story from the southern oil producing regions. There are plenty of Sunni neighborhoods in Baghdad where ISIS might well be able to infiltrate or even take control. Still ISIS seems far from strong enough to take the city. But as you noted, pipelines make very inviting targets, and as I noted, the Syria/LIbya case histories are not very encouraging, with 90% and 80% declines in production respectively. I guess we could always use the civil wars in Syria and Libya as models. From the fourth quarter of 2010 to the fourth quarter of 2013, Syria’s total petroleum liquids + other liquids production fell by 90%, while Libya’s production fell by 80% (EIA). Things would get very “interesting,” if the Sunni/Shiite conflict spread to Saudi Arabia, especially in the context of a struggle within the extended royal family over who will succeed the older generation of geriatric princes. Furious over Obama’s Mideast policy, the Saudis are shifting away from the U.S.—but where else will they turn? To understand the U.S.-Saudi rift, it is essential to realize that from the capital in Riyadh the world looks more threatening than at any time since the founding of modern Saudi Arabia in 1932. There have been other menacing times. Egypt’s President Gamal Abdel Nasser in the 1960s sought to destabilize the Al Saud by fomenting trouble in neighboring Yemen. In 1979, religious fanatics took over the Grand Mosque in Mecca and had to be ousted by military action. The Saudis feared, in 1990, that their kingdom was next after Iraq’s Saddam Hussein invaded Kuwait. In all those troubled moments, the U.S. was either a trusted if silent supporter of the Saudis or an active defender, as in the 1990 Gulf War. Today, the Saudis find themselves alone regarding Syria, trapped in a proxy war with Iran, their religious (Sunni Saudi Arabia vs. Shiite Iran) and political enemy. The Saudis had sought and expected U.S. help in arming the rebels against Syrian ruler Bashar Assad, but the military aid never materialized. . . . These external challenges come at a time when senior members of the Saudi royal family are consumed with a generational succession. A geriatric band of brothers has ruled the kingdom since the death in 1953 of their father, Abdulaziz Ibn Saud, the country’s founder. Power soon will have to go to a son of one of those three-dozen brothers. But who? Each brother feels one of his own sons deserves the crown—which would keep his family’s branch in line for royal succession and likely shut out the others. There are hundreds of these grandsons of the founder. Managing royal family politics must be a daunting task for the 90-year-old King Abdullah, already weakened by three back surgeries in four years. The Gulf producer, the only country with a significant base of idle capacity, has often said it could ramp up its production to 12.5 million barrels a day in the event of unexpected disruption to oil supplies elsewhere. But Gulf oil officials say that pumping anywhere near that level and sustaining it is only possible on paper. “Saudi Arabia is now producing around 9.7 million barrels a day. Our best case scenario is seeing its output rising by another 1 million barrels a day or 1.3 million if the oil market is in a disastrous state,” one Gulf official at the Organization of the Petroleum Exporting Countries told The Wall Street Journal. “Going above that is very difficult to sustain and will require producing quite heavy crudes, which buyers wouldn’t want or need,” the official said. . . .
A person familiar with the operations of the kingdom’s state-owned giant Saudi Aramco said it could produce up to 11.5 million barrels a day but only for a very short period. “In reality, producers including Saudi Arabia have maintenance schedules and there is always about 10% of one country’s production down. You have to remember Saudi also has a spare capacity buffer it likes to maintain,” the source said. . . .
Saudi production “even at 11 million barrels a day, it is untested. We don’t know if they can do it,” another Gulf oil official said. I hear Jerry Brown’s new California budget has an awesomely regressive gas tax increase, but I haven’t seen much written about it. Jeffrey J. Brown: I believe that Karen Elliott House is playing to your confirmatory biases. The USA and Saudi Arabia have had numerous disagreements over the years, in particular strong US support for Israeli ethnic cleansing. Her style of writing reminds me of Thomas Friedman in the NY Times. I would be less concerned about a strained relationship between the US and Saudi Arabia–and far more concerned about the Sunni/Shiite conflict spreading to Saudi Arabia, especially in the context of an internal power struggle over which of Abdulaziz Ibn Saud’s grandsons will become king. I have (I think accurately) described Saudi Arabia as “Metastable,” in that it appears to be stable, but it is actually inherently unstable, for a number of reasons. Incidentally, the BP data base for 2013 shows that Saudi net exports of oil fell from 8.6 mbpd in 2012 to 8.4 mbpd, which would be the eighth year in a row that Saudi net exports were below their 2005 annual rate of 9.1 mbpd (total petroleum liquids). As of the end of 2012, I estimate that Saudi Arabia had already shipped about one-third of their post-2005 CNE (Cumulative Net Exports). My impression is that the Saudis do well under attack. It is the peaceful periods that challenge national stability and risk bankrupting the state. Given the absolute disrespect Americans have displayed for Arabs and other Muslims in the region, I would say that Saudi Arabia has been an incredibly strong and reliable ally of the USA. The rhetoric of cultural superiority and the actions of ethnic cleansing are hard to swallow. Unless of course, you happen to be wearing the boot heels…. General comment to the American posters: Like elsewhere, there is a much hysteria in this discussion regarding Sunni separatists. The overwhelming majority of ‘interests’ in the region are aligned against these bloody Sunni nationalists. Relax, take a deep breath and read widely. Ricardo: If you are reading, I answered some of your questions about private oil companies operating in Colombia in the previous post by JDH. I invite you and others to update your information set. 2 months ago, I put a comment on quantitative gas price calculation in Central Europe, Germany, here, back to 1990. Taxes about 60%, crude about 30% and with the exchange rate, S&H 10% steadily growing with 2% inflation, done. Good question grenauer. Prof. Hamilton has addressed that question in earlier blog posts. Here is my own concise summary. 1. Consumers and producers are price takers. 2. Oil prices are set globally but WTI has traded down because NA production has grown quickly and much is “behind pipe”, i.e., constrained from reaching offshore markets by insufficient infrastructure. 3. Export restrictions also make it difficult (not impossible) for US oil to be restricted. 4. Shipping protectionism discriminates against US oil being shipped to other US destinations. 5. Gasoline and diesel, bunker oil, etc., are globally traded final commodities that face fewer trade hurdles than US domestic oil. Some US refineries have made windfall profits. The fierce US cheap energy entitlement shapes much policy. But in the end it is the play of special interests that determines policy. Talk of national energy security is mostly that: talk. How it all plays out will be interesting. typo watch ….. no preview…. thanks for your reply, and seconding you with taming the panic. Probably I should have phrased that better. What is a low WTI good for, for the US consumer, if RBOB and the gas station price is controlled by (European) Brent ? With Germany, as a very reliable ally,. a European nation with about 80 – 90 % of the western panzer force, and the military draft just temporarily suspended since 2 years , nobody in Europe feels the need to raise defense expenses to even 2%. Dutch and Belgians do not have any tanks any more, and just get invited to do a few joy rides at Grafenwoehr. In my opinion, the WTI/Brent price differential is pretty much irrelevant to consumers. Mid-continent refiners are happily paying WTI prices for crude oil, but charging Brent based prices for refined products, and pocketing the difference as higher crack spreads. People drive too slow. Smooth, quick acceleration is better and keeping speeds down to prepare for stops when there are intersections and turns would likely do more than vehicle re-design. to evaporate any time soon. end users, their economies and standard of living. Thanks for posting your reply on the Professor’s earlier post. I would have missed it if you had not guided me there. I do not disagree with anything that you have said about Colombia. Nothing you wrote conflicts with anything I wrote nor does it disagree wtih my friends. One thing you need to understand about my friends is they are not oil analysts. My friends are actually the land owners who lease the land to the government, but receive nothing for the oil taken from their land. Nor does it conflict with my friends saying they would increase oil production significantly if they had ownership of the oil. I do not doubt that the government is contracting with foreign oil firms. President Álvero Uribe turned Colombia around in his 8 years as president. He left office as one of the most popular presidents in the country’s history. He virtually ended the sequestros estorsivos and freed many that had been held by FARC for years. He pushed FARC back into the jungle and he cut off the head of the snake. But he also significantly addressed the corruption in the military and significantly ended their robbing of the campesinos. Because of Uribe Colombia became safer than it had been in decades. I totally disagree with you concerning President Santos. Initally supported by Uribe, Santos totally reversed Uribe’s move toward security of the country. He moved toward Venezuela and Chavez and also Cuba. Then he began to negotiate with FARC and has allowed them to reconstitute their military force. This is why Uribe broke with him very early in his presidency. Sadly, Santos was reelected and there is a very good chance that hostilities with FARC will resume as they become more powerful. It does appear that Santos is now using FARC to maintain his power and that is also an ominous sign for Colombia. Since Santos became president the peso has slipped more than 10% against the dollar and increased government intrusion has interferred with business. Colombia had become one of the most open societies in South America and the result was a return of prosperity. Venezuela was once the most free and as a result was the most prosperous but Chavez reversed all of that. Before Uribe Colombia was run by the cartels and the guerilas through bribes and intimidation. Now Colombia is more free and prosperous. Colombia is at a turning point and sadly the recent election appears that the turn is toward the left and away from prosperity. In March, 2014 energy was about 5.5% of nominal personal consumption expenditures. It has been bouncing around this point since early 2012. That is almost exactly the midpoint of the range from the all time low of 3.9% in 2001 and the 2008 recession peak of 6.8%. The all time high was 9.5% in 1980. In 1975, 1980 ,2001 and 2008 energy’s share of PCE rose about two percentage points before the recession hit. 2014 the price was 8.5 cents per $1,000 of income. 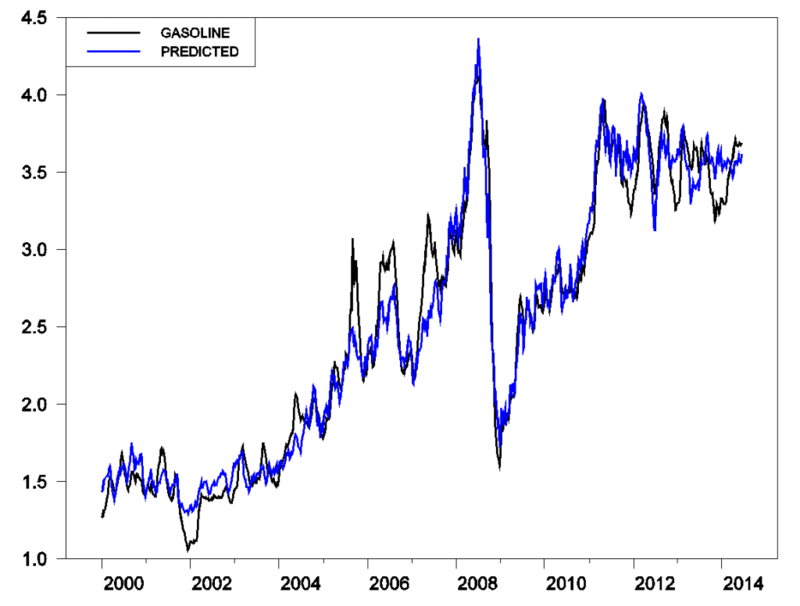 Essentially the real relative price of gasoline has not changed significantly in 50 years. The higher prices are essentially due to currency debasement. In Colombia the oil is owned by the government. How is it you are invested in Colombian oil? Are you strictly invested in “exploration” companies? I am not sure I understand. My Colombian friends all say they would be producing twice to three times as much oil if they owned the oil and simply paid the government taxes on production. As it is the government owns the oil and simply pays a lease fee to the land owner for a small piece of land to rest the pump. There is no incentive for those in the oil industry to increase production because they are all paid a salary by the government totally independent of production. This is one reason there is limited exploration for oil in Colombia and many other countries around the world. It makes no sense to spend enormous amounts of moneyto explore only to see the government expropriate any profits. I must apologize. I thought “they” referred to the Colombian state owning oil producing properties. You were obviously referring to your Colombian friends. Naturally that squares well with the popular notion that extracting oil is simple, push a straw into the ground and out it comes. As for the rest, it is not a question of agreeing or disagreeing with you. You do not understand the business and how incredibly hi-tech it has become nor do you understand Colombian politics. Zuluaga would have continued the peace talks but simply with tougher conditions (or so he said). The median voter theorem is alive and well in Colombia. When the alternatives are considered, all I can say is Thank God. Maybe she believes in free market democracy after all.